BRASILIA, Brazil, December 7, 2011 (ENS) – Deforestation rates in the Brazilian Amazon fell by 11.7 percent from August 2010 to July 2011, reaching the lowest rates ever recorded for the third consecutive year, according to data from the National Institute of Space Research, INPE. Satellite images analyzed by INPE show that an estimated 6,238 square kilometers of forests were cleared in the 12-month period, bringing rates to their lowest since monitoring began in 1988. The decrease represents Brazil’s continued commitment to reducing greenhouse gas emissions, and it comes during the annual global climate change negotiations taking place this year in Durban, South Africa. 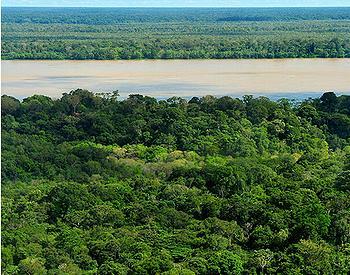 Deforestation reduction is a critical part of Brazil’s strategy to reduce its emissions. Official calculations estimate that meeting deforestation reduction targets could cut Brazil’s greenhouse gas emissions by up to 24.7 percent. In April 2011, Brazil established a task force to strengthen deforestation monitoring and enforcement initiatives in response to INPE data that indicated an increase in Amazon clear-cutting over the previous two months. Since then, the Brazilian Institute of Environment and Renewable Natural Resources, IBAMA, has sent 700 inspectors to the state of Mato Grosso to enforce forest preservation efforts. IBAMA, the Federal Police, the National Security Force and the Army have joined forces to combat illegal logging. Satellite images analyzed by INPE’s near-real time deforestation detection system have enabled IBAMA, with support from the Federal Police, to set up precise and effective enforcement operations to halt illegal deforestation as it happens. This year, eight new municipalities were added to the list of areas with the highest deforestation rates, and these are now subject to inspection. The task force has apprehended 325 trucks, 72 bulldozers and 62,000 cubic meters of illegally cut timber and embargoed 79,500 hectares of land in the region. 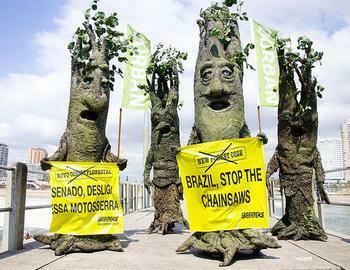 Teixeira said the monitoring and fight against illegal deforestation will continue through 2012. In November 2012, Brazil plans to launch a new satellite that will improve the accuracy of satellite deforestation monitoring in the Amazon, Brazilian Minister of Science, Technology and Innovation Aloizio Mercadante announced at Monday’s news conference. “At the present time, we can use images of 250 meters resolution; and the new satellite will allow us to analyze images of five meters resolution,” he said. 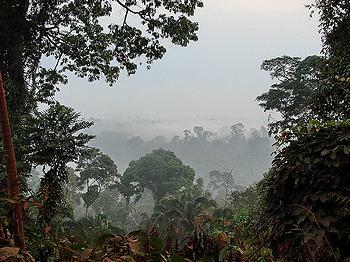 The Environment Ministry says the drop in Amazon deforestation rates is a result of the Plan for Amazon Deforestation Prevention and Control, or PPCDAM, an integrated set of integrated government policies that combine enhanced satellite monitoring and enforcement operations with land tenure regularization, alongside initiatives to encourage sustainable activities in the region. With the support of 13 government agencies, PPCDAM was instrumental in helping to reduce deforestation in the Amazon by 76.8 percent from 2004 to 2010, Teixeira said. Part of the government’s strategy to prevent deforestation and conserve Brazil’s biodiversity-rich forests is the creation of protected areas. According to the Global Biodiversity Outlook 3, a report released earlier this year by the United Nations Environment Programme, nearly 75 percent of the 700,000 square kilometers of protected areas created around the world since 2003 are located in Brazil. But the Senate passed the new Forest Code late Tuesday that will reduce the size of forested buffer zones around rivers, and reduce the amount of land that owners must leave forested. The bill overhauls of the current Forest Code in Brazil, first issued in 1934. It was approved by the lower House of Congress in May. On the sidelines of the UN climate talks in Durban, former Brazilian Environment Minister Marina Silva said the bill could weaken Brazil’s global leadership on forest conservation as a means to limit climate change. “The approved law will make it difficult, and by a lot, for Brazil to keep their emission targets,” Silva told reporters in Durban. She is calling on President Dilma Rousseff to veto the new Forest Code. At the Durban talks, Greenpeacers are demonstrating against the new Forest Code. The international environmental group says the changes in Brazil’s Forest Code will open the Amazon up for dangerous deforestation and will compromise the international agreements former President Lula da Silva signed during the 2009 UN climate conference in Copenhagen that committed Brazil to steep CO2 emissions reduction targets.